In the huge amount of legends that make up the mythology of ancient India, can be found most of our myths, whether they have the same origin, or whether they describe real events. The flood made ManuAdam and Noah for the Hindus live an adventure quite familiar to us. “Throw me into the sea, said Vishnu, I will be more comfortable there”. Then the god warned Manu that a flood would happen soon. Vishnu sent him a large ark, with orders to embark two specimens of each living species and seeds of every plant. Manu obeyed, and he boarded the ark when the ocean swelled and overwhelmed everything. We can see nothing anymore, except Vishnu in his fish body, a huge narwhal with golden scales. 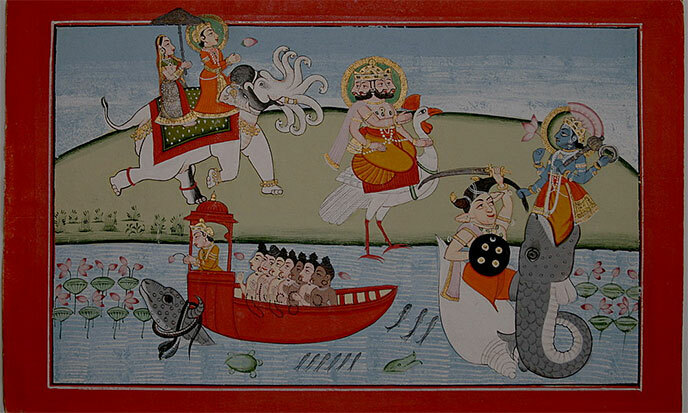 Manu moored his ark to the narwhal’s horn and Vishnu towed it through the waters. Thus they came to the emerged summit of the North Mountain, Former Gods had foresee the flood and prepared shelters on mountaintop. See Les cités des cimes where they ran aground. The fish said then: “I saved you. Moor your ark to a tree, so that water cannot take it away while you are on the mountain. And as the waters will recede, you will get down with them.” And Manu descended with the ebb. 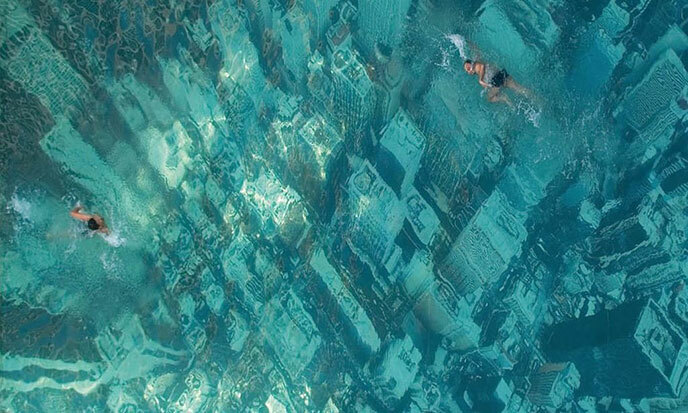 The flood destroyed everything. Manu was all alone. His animals colonized the earth, his plants germinated and nurtured them, but Manu stayed alone in the world. Note that in this version of the myth, once again, the man begins to live without a woman, she comes afterwards. Moreover, when she arrives, she introduces herself as Manu’s daughter. How was she made without a woman to carry her? By genetic manipulation of the DNA from Manu, the only survivor. Let us be clear, the only survivor from the race of slaves. For the divine race, well protected in the Mountaintop Cities of the Andes, or on top of Mount Olympus, or on the Kurdistan Range, or on a gigantic mother-ship, had suffered but little from the devastating flood to which the gods had prepared themselves. Let us return to some revealing details. The Arch of Manu runs aground on the Northern Mountain. Problem: there is no mountain in the north of this planet. 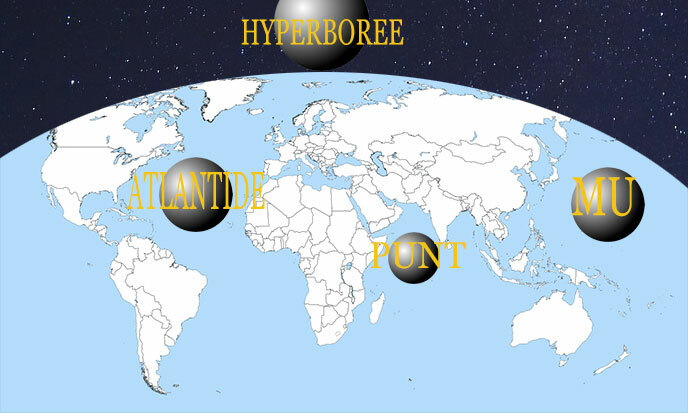 On the other hand, there is the domain of the gods, above the north pole, as the legend of Hyperborea teaches us. For they knew every event as they all repeated on the cyclic movement of time. It is a mother ship, a veritable wandering planet that shelters not a few gods but millions of beings in our image, invested with an interplanetary mission: to terraform the wild planets, at least those that are likely to shelter life. Systematically, in all versions of myths, are encoded valuable information that make them educational jewelry, sophisticated and with an almost perfect efficiency of transmission. In the eyes of the truth seeker, the ancient myths are undeniable masterpieces, on the same plan as the cave paintings of Lascaux or Altamira. Such a perfection could be achieved only by the careful effort of great sages. 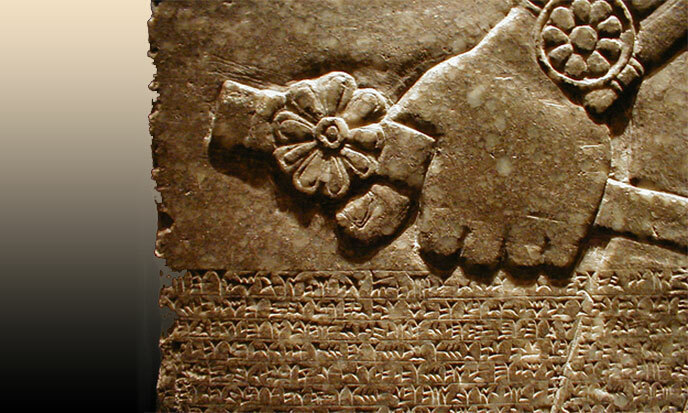 Thus we can see in the ancient myths a unity coherent, realistic, documented, and it deserves all our attention. This valuable legacy constitutes for our mankind the testament of the former gods. 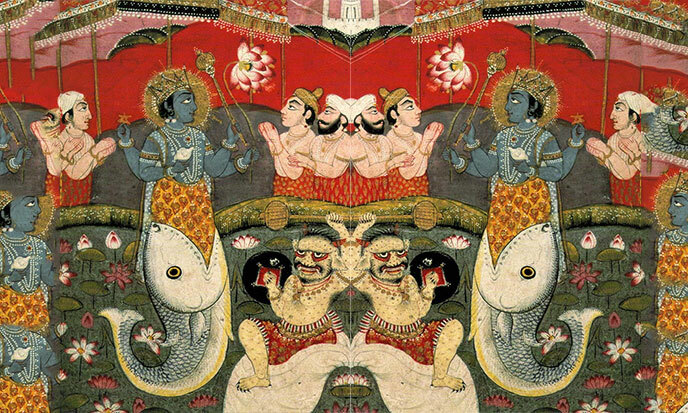 Here, Vishnu, one of the three gods of the Brahmanic trinity or religion of Ram, clearly appears as a man-fish. We know the role played by some snake-men in the creation of our species. We know the fish gods, such as that of the ancient Persia, Oanes emerging from a lake, like Tiki Viracocha in the Andes, leaving Lake Titicaca. Vishnu does he represent the creator of Manu, the first man? Even if this is not clearly specified in this myth, the answer is yes. For in the Brahmanic trinity, Vishnu is the father creator, Brahma is the Holy Spirit, and Rudra the destroyer. Note that thereafter, Rudra will merge with Shiva the Source, the only god of the previous religion. In the Dravidian Shivaism, no trinity indeed, but one principle, both immanent and transcendent, might be called the Source. When Ram came to India in the fifth millennium BCEBefore Common Era he introduced a coarser religion, in which the gods were only the princes of the first Atlantis… How Ram could he tolerate a god superior to his own three? He therefore gave to the former god a role in the Atlantean Trinity, the role of the wicked, of course. So that believers turn away from him faster. All new religions have done the same with the former gods. The Old Western Religion has been relegated to the rank of naive superstition, as its gods have become the demons of Christianity.